I just finished a delightful garden project with Monica’s help and support. Our new garden bench brings together stained glass and one of our favorite artists, Vincent Van Gogh. 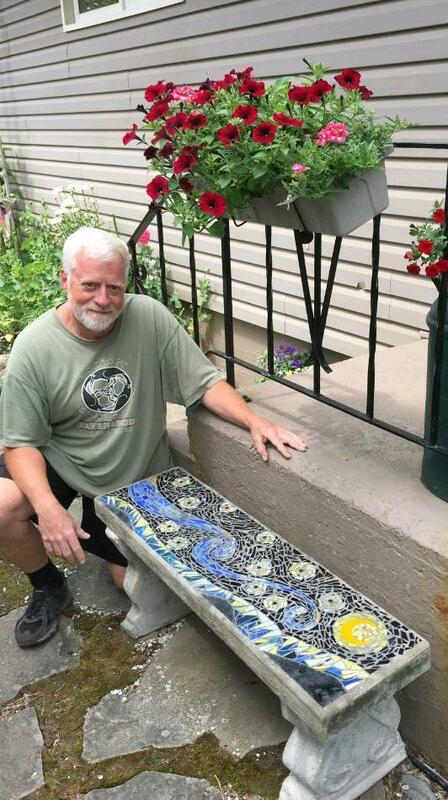 Here is the full story to the making of ‘A Starry Night Garden Bench‘. Beautiful, Nelson…and nice to see that you are doing something for yourself too. What a lovely reminder of art work you have seen. Thanks Marg. Monica want me to note that it was all her idea. And I’m so glad she thought of it. Looking forward to seeing you soon. Thanks Mae and Monica says thanks too. LOVE van Gogh. What a cool idea. Must have been fun to work together on this. It was, Diane. We just haven’t dared sit on it together yet (wink).